Hallelujah! Spring has finally sprung and Easter is almost here! 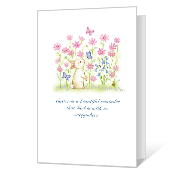 Let's celebrate the joys of the season by sending Easter eCards. 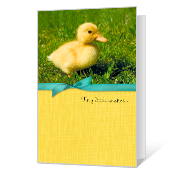 Family and friends will love these happy Easter greeting cards, loaded with special Easter Wishes! Looking for some Easter fun? Welcome to the Egg-ceptional Easter Hidden Objects Game... Wishing you a Happy Easter! Shake Your Booty and Have a Happy Easter! Wishing you a warm and wonderful Easter and a bright and beautiful Spring. 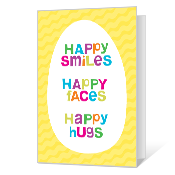 Let them know eggs-actly how you feel with these special eCards that say it your way! 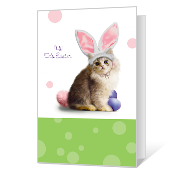 Select, design and print one of our fun Easter cards! Cover Verse: Happy smiles Happy faces Happy hugs Inside Verse: Happy Easter! Cover Verse: Hi! It's Easter! Inside Verse: Wishing you a purr-fect spring, A happy day, and everything! We have a basketful of new Easter eCards for everyone you know! These happy Easter greetings are sure to delight your friends and family. From sweet and funny to warm and religious, we have Easter wishes for all the special people in your life.